Make the dressing: Combine the sunflower seeds, lime juice, honey and salt. Whisk in basil olive oil until emulsified. Or, place all in a blender and blend until smooth. 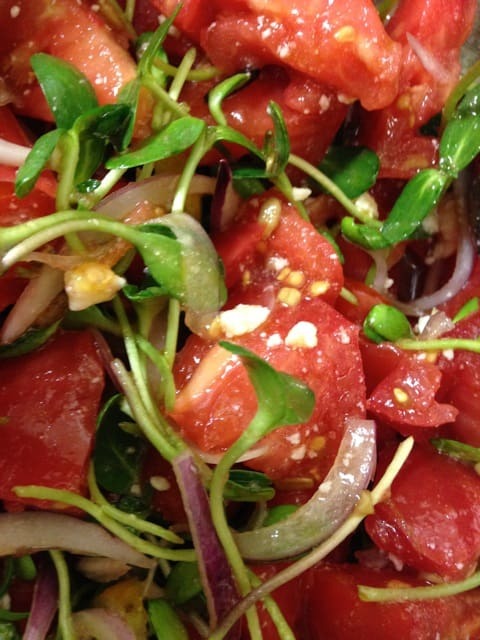 In a bowl, add the tomatoes, 1 1/2 cups of the sunflower sprouts, red onions, dressing, and salt, and toss to combine. Arrange on a serving dish and garnish with the queso fresco and remaining 1/2 cup sunflower sprouts.